The VK246H 24" Widescreen Monitor from ASUS is a monitor focused both on beautiful, clear images and on comfort. The ergonomic design includes high-degree viewing angles, 25° of tilt and adjustable height. A high dynamic contrast ratio displays vivid images, and Splendid Video Intelligence Technology provides five video modes and three skin tone modes, giving you complete control over the image on your screen. The 16:9 wide screen with 1920 x 1080 resolution is optimized for Full HD. 1080p vision and enables borderless full-screen video display, while embedded HDMI simplifies cabling and provides the highest-quality video and audio experience. The monitor allows for stunning playback of HD-DVD and Blu-ray discs. The monitor features a built-in 1.3 megapixel webcam making it easy to conduct face-to-face live conversations with family, friends or online game partners. It features Smart EV (Exposure Value) Control technology to cleverly compensate for poor lighting conditions. The webcam is plug-and-play for easy connection and easy use through the USB interface without installing extra drivers. The bundled LifeFrame2 software you can create your own video clips and slide shows. ASCR (ASUS Smart Contrast Ratio) Technology automatically adjusts the luminance of the backlight for better displays according to the image contents, and improves the contrast ratio to 20,000:1, resulting in more realistic depictions of night scenes when playing games or watching movies. The aspect control function allows users to select a preferred display mode among Full and 4:3 for true-to-life gaming or movie watching without any data loss or image distortion. Splendid Video Intelligence Technology adopts a color engine to detect activation and usage of video applications and automatically optimizes image quality with intelligent color, brightness, contrast, and sharpness corrections for the best visual results. Splendid Technology offers 5 video modes designed for scenery, theater, gaming, night view, and standard images, 3 skin tones of yellowish, natural and reddish to add a human touch to videos on PC. You can see optimized images on screen and select five modes via hotkey quickly at your will. With height adjustment and tilt functions, you no longer have to contend with improper sitting postures or awkward viewing angles. Adjust the viewing angle according to your line of sight to enjoy greater comfort for long hour usage. Convenient key controls facilitate easy setup using the multi-language OSD. Built-in hidden stereo speakers provide multimedia enjoyment. The base is detachable, and VESA standard 100 x 100mm mounting configuration allows easy wall or arm mounting. VK246H 24" Widescreen Monitor is rated 4.5 out of 5 by 8. Rated 5 out of 5 by Anonymous from good product. Excellent clear image Nice colors. Clear images. Good option to select the view type like, Normal, Gaming, Scenic etc. is good. I was using viewsonic 19 inches monitor before this and you can easily observe the difference in better quality of images and colors in new monitor. I tried some HD pictures and they turned out to be excellent. As I have not connected the monitor speakers, I will not comment on that. Adjustment need little understanding. 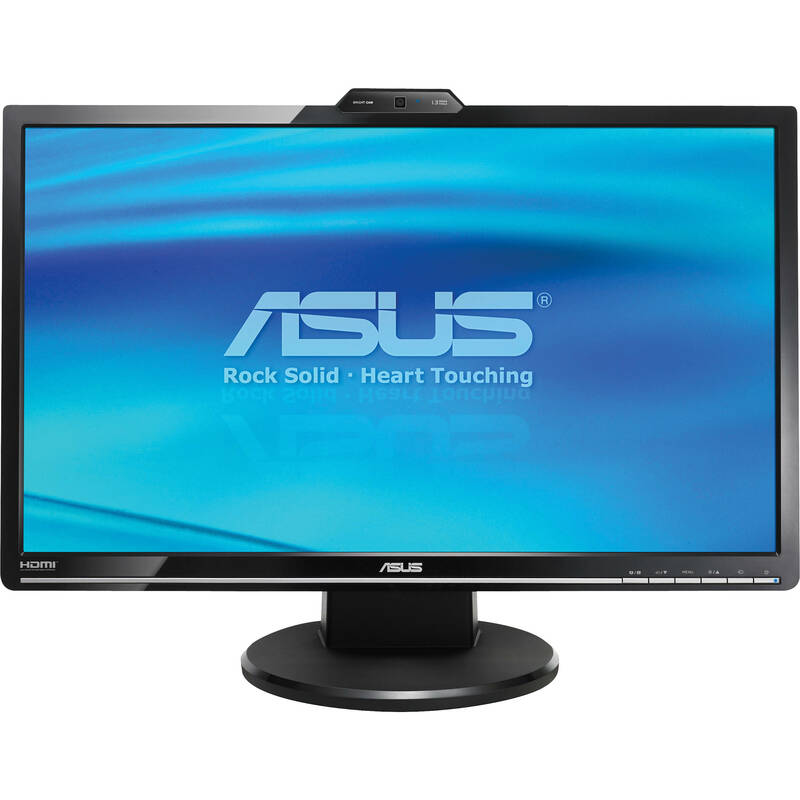 Rated 4 out of 5 by Raptor Media Group from Good Value This monitor is a great value. The images are excellent. I am not experienced in web cams but my initial observation concluded that this one doesn't seen to do well in low light. It's not as good-looking aesthitically as the higher end samsung I considered but if you are just concerned with image quality and price this one is a good bang for the buck! Rated 4 out of 5 by Megan the Data Nerd from Good image quality, poor speakers I bought this monitor for my laptop so I can see multiple spreadsheets and code side-by-side, plus some casual photo processing. I had it up and running within 5 minutes of unpacking. I docked it 1 star because the speakers sound muffled and dull, but I'm learning to live with it. Rated 4 out of 5 by Anonymous from Awesome Monitor for the price Great Picture, extremely easy setup, Speakers and webcam incorporated into the product. Unbelievable bundle for all that is included, Included all wires and software as well. B&H is awesome place to get all products. Rated 5 out of 5 by Abusus from Excellent product, will recommend it ....everything you need is in the box, excellent brightness and contrast.everything you need comes in a box, wish it had hdmi cable.overall i am very happy with this product, and will buy it again. Rated 4 out of 5 by flyingbrix from Big screen good price, no complaints yet Has a lightweight (flimsy) stand that leaves it top heavy, but it seems well balanced. The screen swivels vertically, but there is no height adjustment. Up and running in seconds out of the box. Rated 5 out of 5 by Mishonok from I would buy this product again We lOVE this monitor! We use this product for our computer and the size is perfect for our needs. You can adjust every parameter on it. Moreover, the price and quality are great!